#4 – Anomia – What's Eric Playing? July 25, 2015 November 6, 2016 • What's Eric Playing? Base price: $16, base game; $30, Party Edition. Play time: 30 minutes per round. And now for something completely different. Anomia takes us back out of microgames and into “short” games, which is to say back to the place that we started and were likely going to continue always being at with the occasional minor detour in the same way that your permanent address is the place that you live, but you’re allowed to leave sometimes without having to forfeit your permanent address because you’re not permanently there. Probably. Anyways. 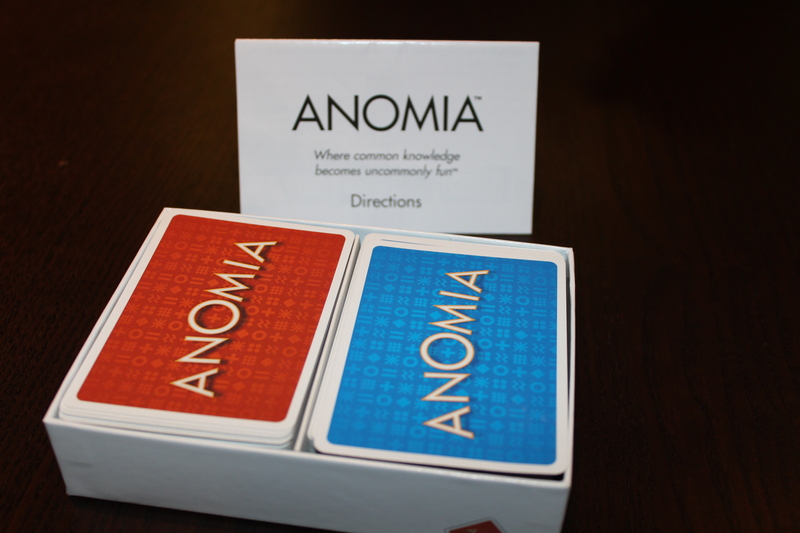 Anomia is a fast-paced word game based primarily on understanding examples of categories and being able to quickly match colors and symbols. Now, reading this, you’ll probably think that those both sound pretty easy. If you ever get the chance to play Anomia, you will be quickly surprised at how wrong you are. I’ll breeze quickly through setting the game up (it’s very fast!) and then explain why it’s such an interesting departure from other games I’ve played. Pick one! That’ll be your starting deck. Note that the base game comes with two decks and the Party Edition comes with six (completely different from the base two decks). Personally, I’d recommend all eight, but that’s me. Anyways, shuffle a deck, split it into two piles, and set the two piles down with some space in between (about two cards’ width). This will make sense later, as I’m explaining the cards. That’s it! On it are two of the same category and some sort of colored symbol. There are eight different symbols in the game, and they each have a different color so that the game is just a little bit more difficult for colorblind people (thankfully, the shapes change, too). Now that this lengthy explanation of what an Anomia card is has been successfully completed, let’s go straight to gameplay. 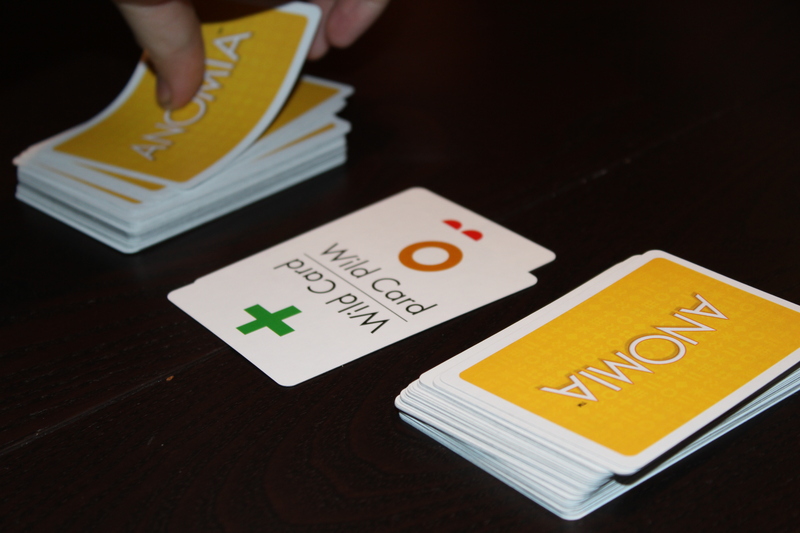 Anomia is played in turns, where each player on their turn flips a card off of one of the decks face-up in front of them in a stack. If your symbol is totally unique, then nothing happens and you keep moving, covering that card with another card on your next turn. Note that you sometimes have more than one face-up card in a pile in front of you, if you continually don’t match anyone. Should your symbol match another player’s symbol, that’s where things get interesting. You immediately enter what’s called a Face-Off (no, not THAT Face/Off) with that player. You now need to give an example of their face-up category before they can give an example of yours. 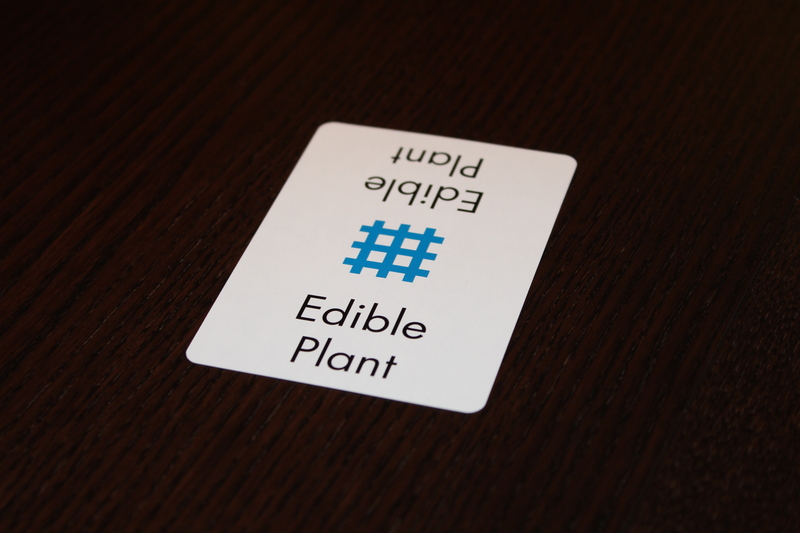 To give a more concrete example, if I had just drawn the card in the picture I posted above, the other player would need to say an edible plant (there are many) before I could say an example of what was on their card. Should you win, you take their card and place it face-down in a pile behind (or next to, I’m a board gamer, not a cop) your face-up cards. Now, remember that you might have a pile of cards face-up in front of you. This means that if you lose a face-off, you might reveal a card that still matches their symbol (or another player’s symbol! ), forcing another face-off. This is called a cascade, and is totally legitimate. You must resolve all face-offs and cascades before the next player can take their turn. Sounds easy, right? That’s right. Wild cards. (Remember how you left a space in the middle of the two decks? Did you not?) While a wild card is face-up, the two symbols on the card are also considered matching. 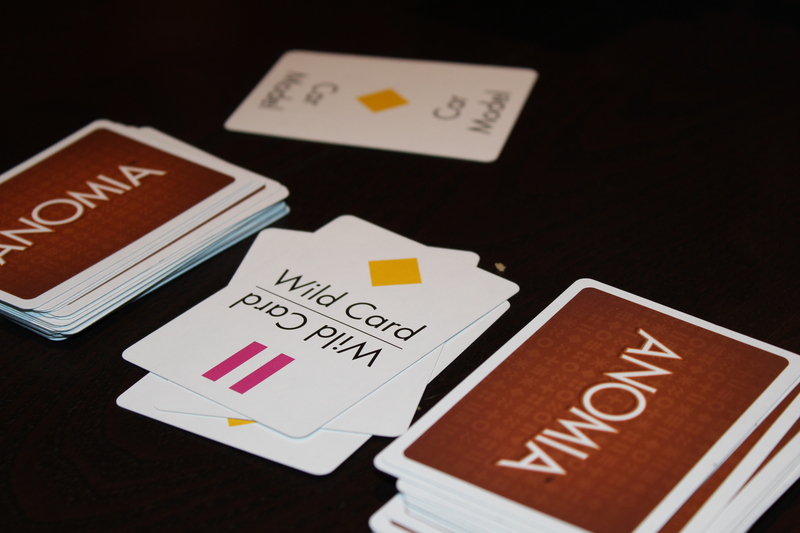 A wild card can only leave play when it’s covered up by another wild card, so until someone else draws one, you can also have face-offs between those two symbols. Because of this, when a player draws a wild card, all face-offs must be resolved immediately, and then that player draws another card before ending their turn. Please note that drawing a wild card cannot cause a face-off between three people. I get asked this a lot, but I’ll leave it as an exercise for the reader why that’s not the case. The game ends when the deck is depleted. Count the face-down cards you have, and the person with the most cards wins! Hooray! Flip the card away from you. This one is a bit difficult to understand, since most people in card games flip the card towards them when they’re drawing a card. Since, for this game, it’s important that everyone sees your revealed card at the same time (so they have the same chance of recognizing a match as anyone else), you should flip away from you. Flip the card quickly. Seriously. You should read it at the same time as everyone else. Do not take time to read the card and then read everyone else’s currently face-up card before playing the card and allowing other players to see it. You’d be appalled how much this happens. It’s really kind of a gamebreaker. To reiterate, you should not see the card any sooner than anyone else sees it, otherwise you’ll have an unfair advantage. More often than not it’s because the player has their hands in such a way that they’re blocking your sight line to their pile either during or after their flip. This is a forgivable thing that many people do, so just nudge the player next to you if they’re accidentally covering the pile with their hand or are flipping the card in a way that makes it tough for you to see it. See that? That’s a perfect flip happening. Nice. So there’s one weird rule that’s enforced sometimes, and that’s what people call the “No Repeats” rule. That means if I name an example of a card while it’s face-up, nobody can use that example for a subsequent face-off. This also applies to failed attempts to win a face-off. If you have “Color”, you can’t keep yelling “vermilion!” until you get it. You have to name a different color each time. Naturally, this can be abused (imagine having month and someone names them all), so we’re a bit flexible around actually applying it. This also prevents people from maliciously listing examples to try and stonewall people. The only major exception is that you can use the same answer for different cards. This means if you have “fruit” for one and “color” for another, you’re totally fine saying “orange!” for both. Always try to be the first one speaking. This has a weird psychological effect to it, in that I’ve found that politer people tend to stop talking when you’re talking, and often give you a chance to finish. This… isn’t a great strategy for them in this game. I know people who just yell “UH, UH, UH” loudly until they can think of something, which is… fine? Aggressive? Both of those things? Don’t always take the cards literally. Famous address? State of the Union is a famous address. But so is 221B Baker Street. Lane Kiffin, Lois Lane, and Drury Lane are all Lanes. As long as it makes sense to the rest of the group, you can usually get away with it. And while Sunset Boulevard definitely counts, it’s possible that your group will accept Boulevard of Broken Dreams. Try to remember what symbol is under your current card. Having the upper hand in a cascade can often get you more than one card at the cost of you losing a card, which is a significant net gain. Focus. You’d be surprised how many people misread cards (cat bread instead of cat breed, which leads to someone yelling meowurdough) or name an example of their category instead of someone else’s. The maximally entertaining option is when someone picks a completely wrong example for a category (24 for a game show or, famously in our group, purple for a shade of green), and you’ll see that a bunch. I think I’m gonna retitle this section since my final thoughts and verdict are really in the next section after I give it a ranking. This is more the pros and cons section, since it has pros and … cons. Excellent gateway / opener game. 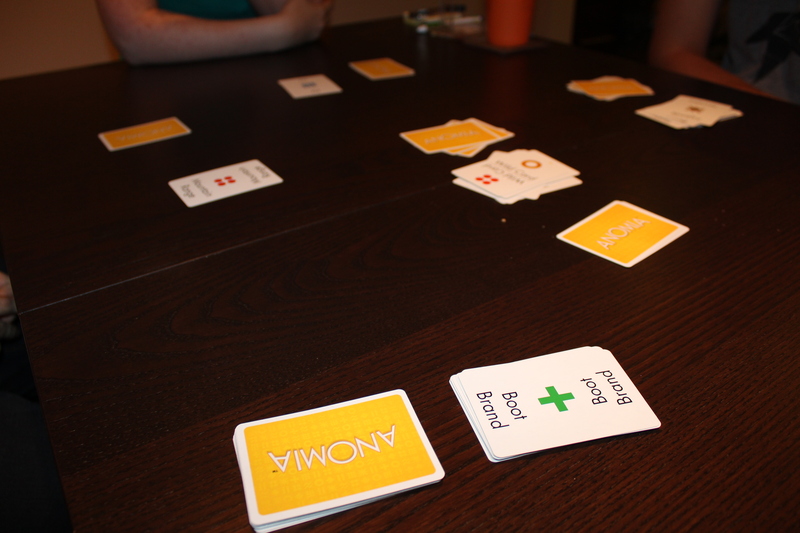 It’s very much just a fast card game (similar in some ways to but with fewer components than Taboo), so people are usually willing to give it a try. It gets people energized and talking, which is a great way to start a board game night, especially when people may or may not know each other super well. Turns out a lot of people may have opinions on whether or not a banjo is an orchestral instrument or if people can be considered monsters. Memorable moments in a light game. Watching people trip over themselves or mix up categories is hilarious without being terribly embarrassing, as big mistakes in games can sometimes be. It’s insulated somewhat because everyone makes them and everyone laughs about them rather than getting upset because a mistake “ruined the game”. I think that’s nice. Also, everyone names “Tom Brady” as “Brady Bunch Member”, which is so wrong that it should be right. Lightweight and transportable. Have decks, will travel. The Party Edition box is a bit huge, so I occasionally just throw some decks in a bag and am on my way. The base box is pretty excellent, though. Fast-paced but still light. It’s a quick game that doesn’t feel exhausting. It has some similarity to the old Egyptian Rat Screw in the sense that everyone’s waiting to jump in and you could be up against anyone, but you’re not competing against everyone, so it lacks some of the intensity. I think that helps, honestly. Flexible rules don’t break the game. Having too much fun? Why not aggressively up the difficulty by requiring three answers instead of one? Why not play in teams where you rotate who answers? Why not try to figure out a two-player variant? The game is well-designed enough that all of these things are possible while still being fun. Some of the cards are pretty great. Explosion Sound is probably my favorite, just because everyone has fairly different reactions to them, and they’re all pretty great. Card flipping is hard to master, and that makes a huge difference. It’s weird that such a light game depends on such a weird thing, but the way you flip cards can actually make or break other players. I’m not sure how much can be done about that. Low replay value. I usually tell people that each deck can be played once approximately every 3-4 days. This gives you time to forget the cards. If you try to play it sooner than that with the same deck, you’ll be primed and likely just give the same answers that were successful last time. This reduces the game to who can match symbols the fastest, which is uh, …fun? That’s one of the major reasons I recommend the Party Edition — usually people want to play three rounds, meaning the base game is just barely insufficient. There’s this weird sense of disappointment if you don’t match with anyone on your turn. Especially with smaller groups, it’s fairly common to not get that many face-offs. They suggest taking some of the symbols out to mitigate that, as if you don’t, you might just get hosed by not getting that many matches. Considering winning scores typically range from 15-20ish, missing out on three matches can often decide a game. Fairly English-centric. It’s a word game, so it does kind of hurt people who aren’t as great with English, especially if everyone else is. That’s a bit of a bummer. Not for every personality. Like I mentioned earlier, if you’re quiet or extremely polite, this game is primarily about interrupting other people and being louder than they are. This makes it really difficult for some people to play, which is worth noting if you’re gonna introduce it to your group. Not great for new players. If you’re playing with a new player, they may fall into what’s called a “feeder” role, in which they consistently lose to a more experienced player. This causes that player to have a much higher chance of winning while also being bad for the new player, which isn’t a great experience. This normally goes away after the second or third game, and the games are short enough that it’s not that big of a deal. I’d call this one of my favorite games, and certainly one of my favorite party games. It’s fun, it’s fast, and it’s frenetic. I like the variety of the decks, and I like that it’s very different from most of the other games in my library. For me it’s a great bridge between the Taboo / Bananagrams / Scrabble style games I used to play and the games I play now. I think if you’re looking for something to get a group talking and energized, this is a great game to start off with. Then, once they’ve loosened up you can bring in some of the other games in your collection. It’s got a lot going for it. That being said, I’d love to see some experiments with roles or hidden abilities and seeing how that affects gameplay, or at least some expansion decks that are themed (or even just more expansion decks). Anomia Press said that they working on some more expansion decks … in 2012. That’s okay, Anomia Press; I can wait. Posted in reviewTagged board game, board games, card game, card games, competitive, competitive game, party games, tabletop, word game, word gamesBookmark the permalink. Great review. I also enjoy this game but your cons were very fair and thorough. Personally, the flipping was never a problem as I’m used to Jungle Speed. I’d be interested to try a variant with everyone having their own little pile of cards, so that folk are moving cards over a shorter distance and the ‘reverse flip’ could be more easily done/policed? Thanks for the comment! I’ll check it out.